Here’s a feminine, lightweight cotton camisole for summer, with flattering waist shaping and easy lace edging. It’s knitted in the round, so you’ll only need to sew two short seams. 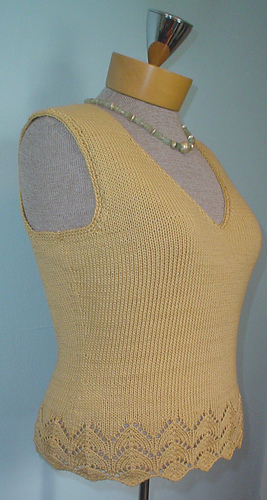 Neckline and armholes are finished with simple crochet. A note about this line, under Divide for Neckline: Next Round: K 45 (49, 54, 58, 62), turn. P 1 row across all sts. You will now work back and forth in st st, beginning and ending rows at the place you just turned your work. This is the center front of the vee neckline. “P 1 row across all sts” means all sts on the needle, not just back to the beg-of-rnd marker. 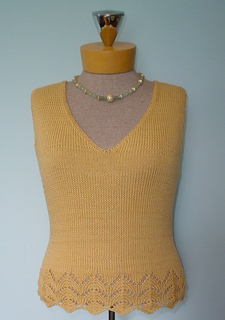 You need to purl all the way around to the other side of the V-neck, because the body is still in one piece at this point, not divided into front and back.